With a pan-India presence and relatively high-yielding book, they remain attractive candidates for mergers and acquisitions by relatively larger entities. Micro finance lenders like Equitas Holdings and Ujjivan Financial Services, which had converted to small finance banks, faced twin challenges of soaring delinquency in the aftermath of demonetisation and higher operating expenses on account of conversion to a bank. The erstwhile highly profitable businesses reported losses in certain quarters of FY18. However, their performance in the first quarter of current fiscal is reassuring. The toxic book is now largely provided for. The worst of asset quality issues are behind them, although some lurking fears in the minds of investors cannot be wished away in a pre-election year. 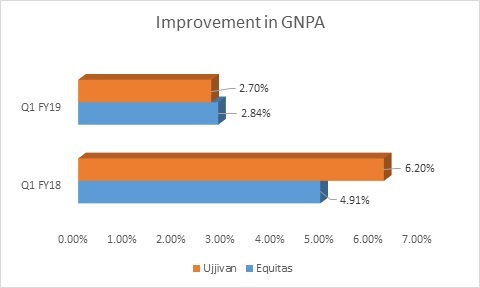 In the quarter under review, Equitas exhibited stability in its asset quality, whereas Ujjivan saw a tad improvement over the previous quarter. Along with asset quality pressures, performance of these entities was impacted in the past because of conversion to small finance banks from their erstwhile status of micro finance lenders (MFIs). Banking operations appear to be stabilising and growth is making a comeback. 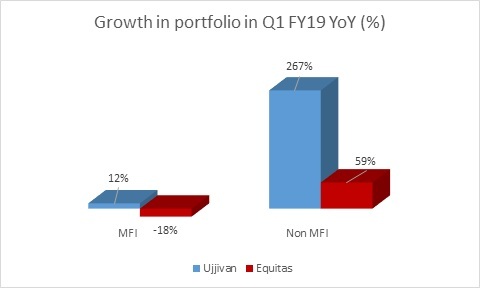 In Q1, assets under management of Equitas and Ujjivan have grown 28 percent and 21 percent year-on-year, whereas disbursements grew a strong 80 percent for Equitas and a respectable 23 percent for Ujjivan. The momentum prior to demonetisation is clearly visible and growth is much more broad-based. For Equitas, the YoY growth was mostly driven by non-microfinance portfolio, which has now grown to 73 percent of the total. It is heartening to see the high-yielding micro finance portfolio growing respectably in the last quarter. 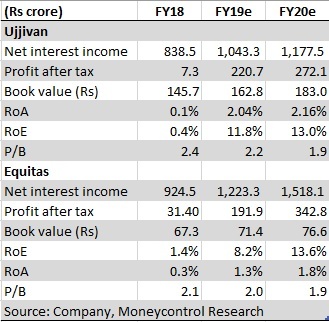 For Ujjivan, the non-MFI book is still a miniscule 10 percent but has been showing strong traction from a YoY and sequential (quarter-on-quarter) perspective. Ujjivan is de-risking its portfolio and is targeting one-third share of its portfolio from secured lending in the coming three-years. Operating expense rose due to rapid rollout of bank branches and muted interest earnings as a large part of the micro lending book was not yielding returns. This resulted in a sharp spike in the cost-to-income ratio. The management of both Ujjivan and Equitas feel bulk of the capex is behind it and effective sweating of assets and improved productivity would gradually bring down the C/I ratio. Diversification of the asset book in favour of secured lending comes with the risk of lower yielding assets. The only way to protect margin is to lower cost of funds and hence access to deposits becomes a critical differentiator. For Equitas, deposits that stood at 29 percent of total borrowings at FY17-end has now touched 49 percent. It has done reasonably well in garnering low-cost current and savings accounts (CASA) that now stands at 32 percent of deposits. Consequently, the cost of funds has fallen to 8 percent from 9.2 percent in the year-ago quarter. The fall in interest spread is much lower than the overall decline in yield on advances. The share of deposits in total borrowing, which was 6 percent for Ujjivan in the year-ago quarter, has now increased to 49 percent. However, the deposit composition is skewed towards wholesale, with the share of CASA at 6.3 percent. An improvement on this front would support future margin. 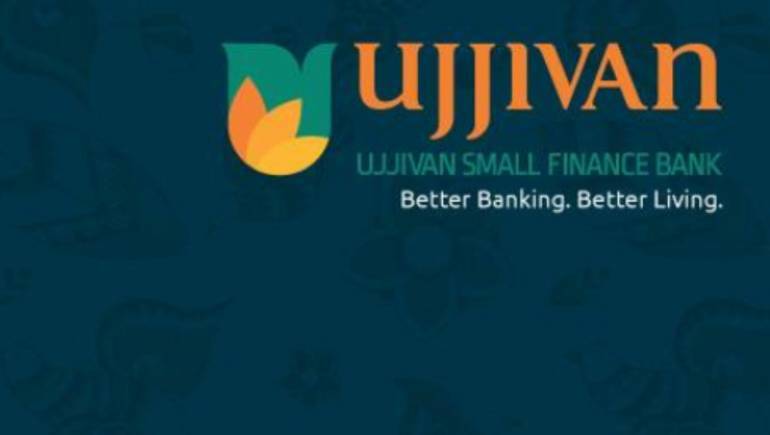 Ujjivan, nevertheless, has seen stability in its interest margin, thanks to decline in the cost of borrowings to 8.6 percent at present from 9.8 percent in the year-ago quarter. 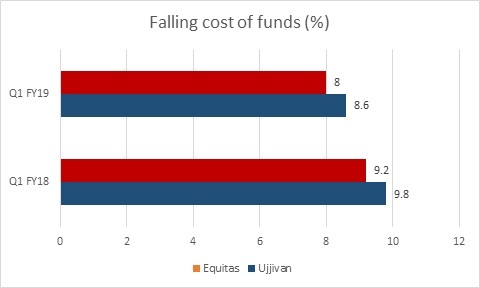 For Ujjivan and Equitas, credit cost had shot up 400 bps and 252 bps in FY18, respectively. With the toxic book of micro lending post-demonetisation largely provided/written-off, credit cost normalisation should propel earnings growth from FY19 onwards. Both Equitas and Ujjivan are extremely well capitalised. This should take care of growth over the next couple of years without any risk of imminent dilution. Ujjivan has a capital adequacy ratio of 23.8 percent. Equitas has Tier I capital adequacy of 26.6 percent with total CAR at 27.7 percent. While Equitas and Ujjivan have rallied from their bottom (52-week low), they still look inexpensive compared to the valuation they enjoyed prior to demonetisation, albeit with the prospect of lower return ratios (RoA). With a pan-India presence and relatively high-yielding book, they remain attractive candidates for mergers and acquisitions by relatively larger entities. Seen in this context, the valuation has enough headroom to re-rate, considering the deal valuation between Bharat Financial Inclusion and IndusInd Bank (3.8 times FY19e book). Investors should definitely look at these two small finance banks.